I think it was the spring before we got married. My farmer sent me a letter with little purple alfalfa flowers folded inside. “The alfalfa is ready to cut when it’s ten percent bloom,” he’s explained over and again. But ready to cut doesn’t always mean it’s time to cut. He watches the weather. Sometimes, he lets the alfalfa bloom more in order to harvest the hay when the sun is shining. Sometimes, he cuts earlier, because he knows rain is coming. I remember visiting a Bible study with a friend, finding them discussing that chapter, and being able to explain the verse about the farmer to “city kids”. Of course, I was only just beginning to understand it then myself. But after six years by his side, through the sunshine and the rain, I’ve become intimately acquainted with the patience that makes a farmer. Praying for rain so we don’t have to irrigate. Praying for a week of sunshine so we can cut hay. Watching the rain clouds go the other way when we need it. Waking to the pounding of raindrops on the roof when there is hay on the ground. The strength of will it takes for a farmer to be patient, to not cut too soon just to be doing something. The trust that’s required when you know rain at the wrong time could drastically lessen the value of your hay. The wisdom it takes as you watch the weather, the calendar, and your field at the same time. The stress of making the decision about when to cut. The early mornings and late nights required between raking and baling. The art of baling with the dew to get just the right moisture content. The relief when it’s all baled. The thankfulness when it’s all sold. 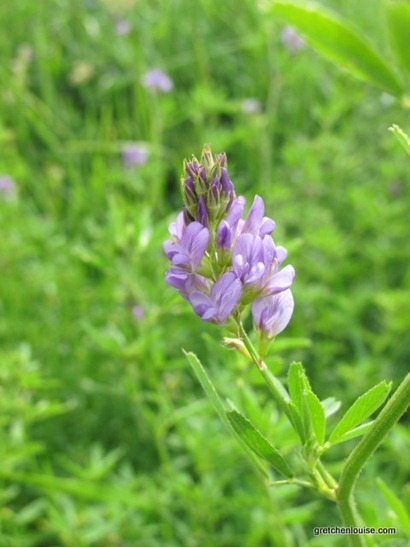 Each year, when my farmer cuts the alfalfa, I catch a whiff of those same little purple flowers he sent me long ago. And each year, I thank God again for a man who’s as patient with me as he is with his farming. First off…I love the new look! 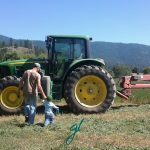 It is the haying/cutting that makes me so in awe of farmers (one because I cannot handle working in the heat/sun, especially with something that makes me itch), but because of the patience and the importance of the task at hand. How so many things can be riding on the perfect timing of the job. What a gentle, yet Truth-filled telling… and a wonderful conclusion to your piece. Of course your image suits it just right too. Gretchen, thank you for writing. I have commented only once or twice, but I dearly love coming back to your website and catching up on posts after a busy week. Your forthright and thoughtful writing is a blessing, reinvigorating my own love for the written word. Please know that your words are a great source of delight and refreshment! Gretchen strikes a beautiful balance between smooth professionalism and personal warmth.